We floated in space, among the multi-coloured galaxies of a NASA photograph. The airless vacuum beneath our boats was so dense with life that we moved without splashing, pulling our way gently though this universe of water and timing our paddle strokes to avoid contact. 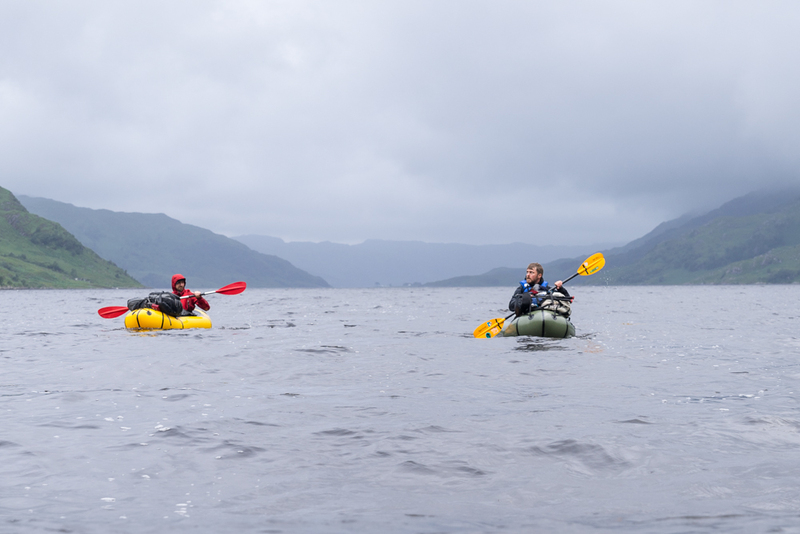 Richard, David and I set off from Beasdale, paddled Lochs Morar and Nevis and finished in Inverie. It was a WET trip and there was plenty of squelchy walking and camping. The route choice was a little arbitrary and planned on the hoof to accommodate the weather, but in retrospect it's a pretty classic 3 or 4 day paddling route. 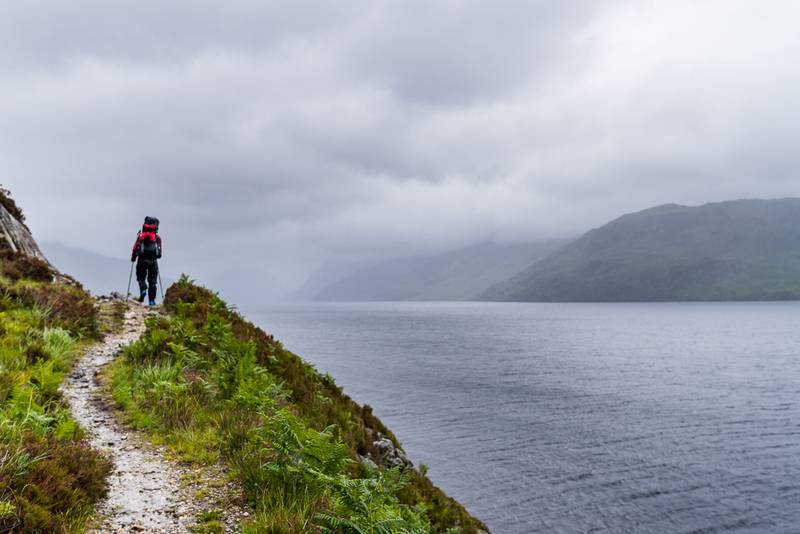 Using the postie path along Loch Morar, and the crossing point at Tarbet (literally, gaelic for portage) is exactly how some of our forebears would have cut about the place... just with less expensive toys. Our train back was a local diesel, but if you timed it right, you could even return by steam train and keep the old skool atmosphere going right to the end. Looking through these, I'm feeling all nostalgic for a wet bum and the shivers again. Now that normal Scottish summertime has resumed, a reprise is overdue. Click/swipe to navigate. Thanks for taking a look. A few images from the most recent outing by the drunken boaters, this time to Olde Oaky, way out west. We are truly misunderstood zen masters, especially after an afternoon in the pub - most will ignore us, but a few will appropriate our watery ninja skills, force-feeding the mainstream with poor facsimiles of the real McCoy. Then again, I may still be under the influence. More about the place in conventional prose format in October's Walk Highlands article. Do you free yourself from fear by cowering in your physical body for all eternity? A funereal raindrop, a beating drum on the shelter skin in the darkness of the woods. Boum, goes the sonar ping, camped on the black isle in the black of night. Boum. These islands are unto themselves. I sleep like the dead we have visited. We are here on some sort of hobos homage, a drunks pilgrimage. To pay our respects to the isle of graves, a visit to an island I last made on my 17th birthday, when a storm blew up and we rowed in panic back to our rented keeper's cottage. This time, we paddle after dark to the graveyard, and barely find our way back across the soft, inky blackness. This time, in the dark, no bells toll for me. It's entirely unfamiliar, not as I remember it. Ladies and Gentlemen, we are floating in space. We make fire on our return, banishing silent, silken death for now. I realise with a shock I haven't sat around a fire since I was last on a journey with David. Six months is far too long, I need to watch for that. The excuse for a reprise this time was Bill's first packrafting trip. Turns out we all had good reasons to visit Loch Awe. From here, west... in search of the islands of immortality... and a cup of tea on a scrubby island with it's own miniature harbour, with the light exploding in the west and making golden remarks on the uplands in the east. We hop from isle to isle, ghosts in an ocean of raindrops, awash in memory. History is so palpable here. The loch is sprayed with crannogs and would one day have been a busy place, a place of neighbours and wooden boats and shelters, of fighting, praise, loving, hating and trading. Now, the nature of these islands is poised, singular - set alone in waiting grace. They are laden, waiting spaces, they are their own, they are their own. We round the isle of graves, sniffing out a still better camp whilst the light lasts. The sun sets where it's supposed to. We forage for deadhang not too saturated, and find enough to keep the wolf from the door. The next day dawns windy, then the rain comes as promised. In the boats, we turn so the wind is at our backs. We have grazed the water membrane of the underworld, and marked the passing of the season. The year leans towards it's end, and the day grows dark again.